Mark Cavendish says he will go all out to win the green points jersey at next year's Tour de France. The 23-year-old 'Manx Express' was in Paris for the announcement of the 2009 route on Wednesday and was more than happy with it. 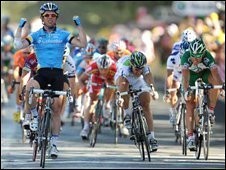 The 2009 race, which starts in Monaco on 4 July, looks better for sprinters, with seven stages likely to be bunch finishes in the first fortnight. He told the Guardian: "Next year I'll be going full-on for the green jersey." In order to claim the overall sprint prize, Cavendish will need to finish the three-week test of endurance. The final week is very hilly, with the penultimate stage finishing at the summit of Mont Ventoux. Cavendish won four stages in this year's race.